Well, it's been a long time but it looks like I've finally gotten my nail art mojo back! And now that I've ordered approximately one-third of all the world's rhinestones from eBay, you'll probably need sunglasses to read my nail posts after they arrive. Haha! Anyhoo, for this week, I decided to try painter's tape instead of the ole striping tape. And you know what? It worked out pretty well! Just scroll down to see! With the colours chosen, I got to work cutting out basic chevrons from a roll of painter's tape. Getting both sides of the "v" even was a bit of a nightmare, but once I got a decent pair of scissors instead of the stupid cheap Dollarama ones I started out using, the process got a lot better. Haha! When all of the chevrons were cut out, it was time to put them to use. Outside, no flash (although the sun was hella bright). I started with my feature fingers because I was scared it wouldn't work out and then I would have wasted time doing the other fingers. Haha, but seriously. It's always the worst when that happens. So, after pressing VERY FIRMLY, all along the edges of the tape, I used avenue maintain and 15 Minutes of Frame to paint above and below the tape. I let the first coat dry for about five minutes before applying the second coat, and after another five-ish minutes, peeled off the tape. Because there wasn't any polish underneath, I ran a small brush soaked with remover along the lines, just to get rid of the little bits of polish that bled. When they looked pretty clean, I gave them a good coat of quick-dry topcoat because I was scared of messing them up while painting my other nails. Haha! Outside, no flash (and the sun was behind a cloud). For my other fingers, I did two coats of Oxygen and, when it was dry, applied medium-sized dots with a dotting tool, avenue maintain, and 15 Minutes of Frame. But, as I'm sure you can guess, the mani wasn't complete without a little sparkle, so I continued my current obsession of picking out hex glitter from Techno and placed one in the centre of each dot, and in the middle of each feature finger. 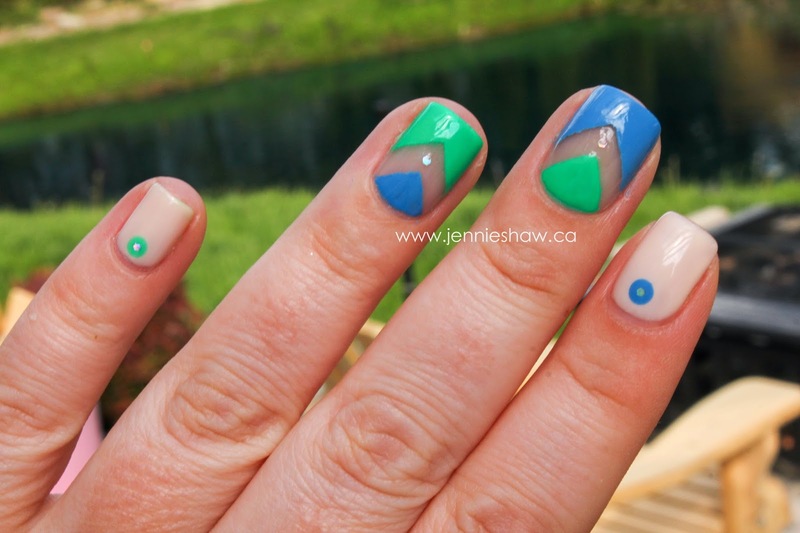 Although I'm biased because this is my own mani, I think that the combo of negative space, simple chevrons, and dots is pretty freaking cool! Haha! I love that the hex glitter from Techno only catches light at certain angles, because when it does, the sparkle is really intense. And I really love the negative space detail, which I've wanted to try again since attempting it, the first time. Woot woot! Hope you all have a fantastic weekend! And don't forget to link up and show off your pretties! I love, love, love this! Negative space manis are so cool. Can't wait to see your sparkly, studded nails! My obligatory ego boost b/c this looks FAB! I LOVE it! Those are the cleanest chevrons I've every seen. I am so trying this. YAY! I like the simplicity of the beige polish with the dot/rhinestones! UM I LOVE THIS JENNIE. I've never used painter's tape on my nails, but it seems like it worked out quite well for you. I really really really love the color combo you used, and the negative space between the two V's. Awesome awesome!